Held each year, CAVES teaches astronauts to explore the underground system of the Sa Grutta caves in Sardinia, Italy, as a team, delving deep underground to perform scientific experiments as well as chart and document their activities. 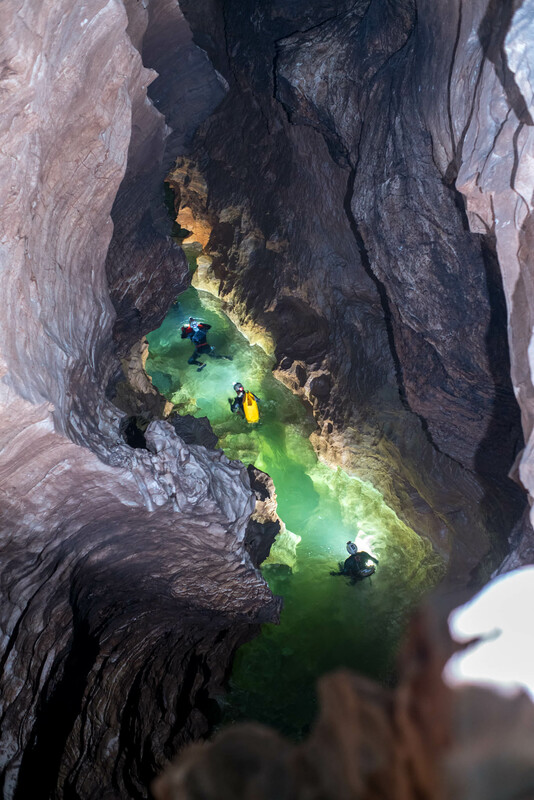 CAVES stands for Cooperative Adventure for Valuing and Exercising human behaviour and performance Skills. 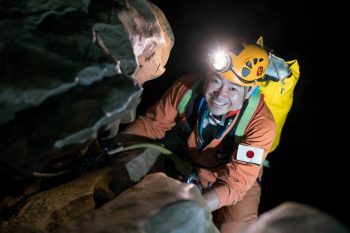 The two-week course prepares astronauts to work safely and effectively in multicultural teams in an environment where safety is critical – in caves. The course is run by the European Astronaut Centre to simulate spaceflight. Seasoned International Space Station astronauts as well as rookies participate in the course and share experiences while learning how to improve leadership, teamwork, decision-making and problem-solving skills. 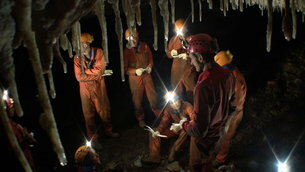 CAVES presents the astronauts with environments and situations very similar to spaceflight, to help them transfer the learning from their caving expedition to space. Behavioural activities are woven into the course to foster effective communication, decision-making, problem-solving, leadership and team dynamics. An important element of the expedition is the daily debriefing, which reflects on the successes and errors of the day, on similarities with spaceflight experiences and on how to reapply successful strategies or improve by learning from mistakes. Learning is enhanced by the presence of experienced astronauts, who share their valuable flight experience with rookies. 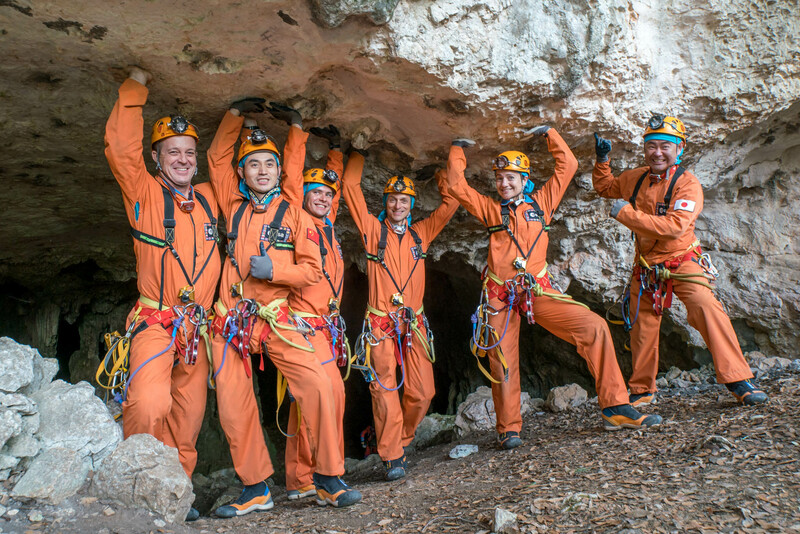 After six days in the Sa Grutta cave, all six crew members and the support team came out from underground. The 2016 Cavenauts were a truly international crew representing five countries. They are: Ricky Arnold, NASA astronaut from Maryland; Ye Guangfu, from the Chinese Space Agency; Sergei Korsakov, test astronaut for Roscosmos; Pedro Duque, European Space Agency Astronaut from Spain; Jessica Meir, NASA astronaut from Maine; and Aki Hoshide, JAXA astronaut from Tokyo. On day 0, we entered the cave in the evening and moved to the “Witch’s Hat”, only a few hundred meters from the entrance. The next day (Day 1) was our first large progression to our main campsite through the Via Ferrata. The progression was technical, using all the tools we learnt to use during our training. We set up our tents, kitchen and toilet. The main campsite was to be our main home for the next few days. On Day 2, we headed out to the 4th Wind Branch, which extended north from our campsite for approximately 1.1 km till the “Baikal Lake”. The main objective of the day was to find an advanced campsite past “Baikal Lake”, which needed to have a water source close by, a good place to sleep (flat and soft, i.e. not on rocks! ), and communication with the main campsite via radio. Once we found a suitable location, we returned to our main campsite, and returned to the advanced campsite the next day (Day 3). On the way we did more science and a survey of the area which we continued on Day 4 to explore further than our advanced campsite. On Day 5, we started the trip in a different direction. From the main campsite we went south through the Lake’s Branch to Jericho Wall, about 2.4 km through lakes in wetsuits (very different from the first four days!). We found some life forms (!) in Monviso, and did some surveying at Jericho Wall to help make a more accurate map of the area. Day 6 was when we had to pack our gear and return to the ground, where we saw bright sunlight, smelled nature (other than rocks, sands, and ourselves), and were greeted familiar faces waiting for us just outside the cave entrance. We have fulfilled our objectives to be safe, have fun, work together as a team and cover our science, survey and photogrammetry objectives. It was a privilege to have this unique opportunity that only a handful of people have experienced, and we are grateful for all who supported us throughout the expedition. To watch video blogs from each cavenaut on this expedition, click here.